Where the blue sky plays with the water, where the white cloud sleep in the arms of the mountain, where the row of the tree every day take a bath in the green water and the color of forest lives below the water. The sunrise in the early, then smile, the moon surprised to see her beauty in the water glass; the row of stars are sleeping in the arms of the left. Are you thought everything is imagination? 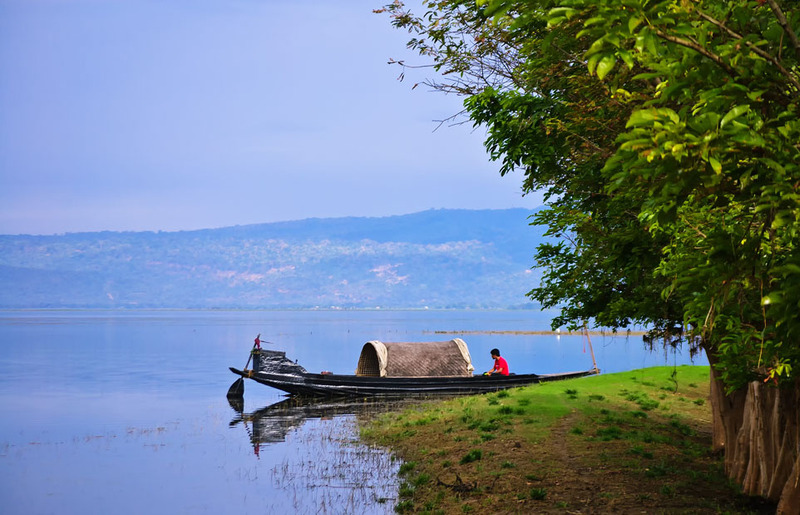 Never - the name of this place is TANGUAR HAOR. This place is declared world heritage site. The Saheb Bazar district around the engine boat by the green cast and by mistake you think, you are sitting in the somewhere in NEW ZEALAND. the mountain is sitting in the arms of his guest on the opposite site of Surma river . in front of the eyes, cows are eating grass like as new Zealand dairy farm. the hill turning the walls behind of the cows. you can see in your eyes in the green beauty. under the blue water, the moss is clearly seen. the rush is dancing in the haor. In the road of anowarpur gram, you can see the rock mounds. here rocks are broken, in the yellow sand rocks are taking sunlight in bed. as the time of going, slowly the color of the water is changed. blue to black, black to green, again deep blue. about six hours after you reach the Tanghuahaour. In the rainy season, the whole tang Hua haor is converted crystalline accurium which height is 20-25 feet. this time anybody can mistake to think the Bay of the bangle. this is tanghuahaor, where the water creates a blue earth by theft from the sky. The cloud is fly under the sky in the rainy season. Dhaka to Sunamganj - 400 TK in Shaymoli Paribahan. many others buses are going without shaymoli and unique. but travel is not comfortable. by rickshaw, you can go Saheb Bazar Ghat from sunamganj bus stand. here you hire an engine boat for Tanguar Haor, every day 3000 Tk need for hire. about five to six hours need to go to the Tanguar Haor. you should buy necessary things if you hire a boat for two or three days. At night you should stay at TaherPUR station rest house. Next day takkerhat, barekertila&jadhu kata river you visit; then you come to the sunamganj. every morning, noon and night bus leave the sunamganj for coming to Dhaka. No need any materials, but you should take the life jacket. it is the rainy road. In the winter season boat will not run. sylhet to tanguar haor, dhaka to tanguar haor, tanguar haor resort, tanguar haor map, tanguar haor winter, sylhet to tanguar haor distance, tanguar haor hotel.